Never stress about organizing your kids clothes again! As the mother of four little boys, I have been blessed with so many generous friends and family who have donated endless bags of boy clothes throughout the years. When you have kids who are all the same gender, people just give clothes to you all the time. But, as the clothes piled up, the laundry piles got even bigger. So naturally, when my sister gave me three huge bags of clothes last week, I knew something had to be done. 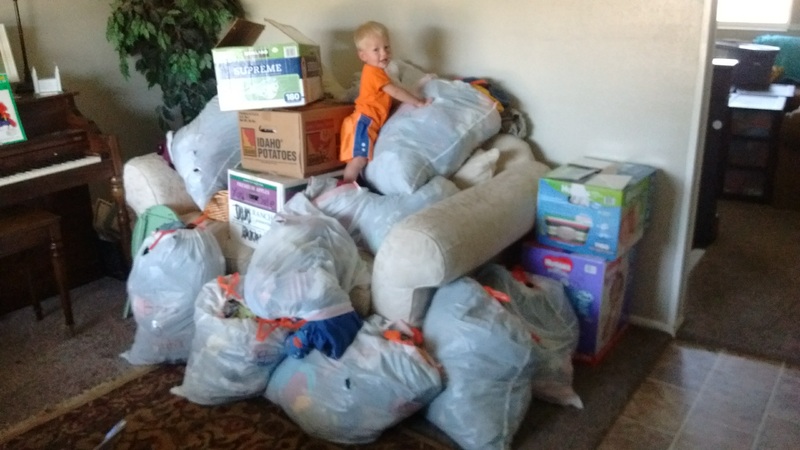 My kids’ closets were bursting at the seems with bags fulls of hand-me-downs. Plus, my kids didn’t need 30 different t-shirts for each day of the month. So I rolled up my sleeves and got to work. Here’s five steps to organizing your kids clothes for good! Wait until you’ve finished doing laundry for the week and then throw all of your kids’ clothes into a huge pile. I’m talking everything! Don’t hold back. Shoes. Jackets. Swim suits. Everything. Once you throw all of those clothes in a ginormous pile, you’re committed and you have to get it done. 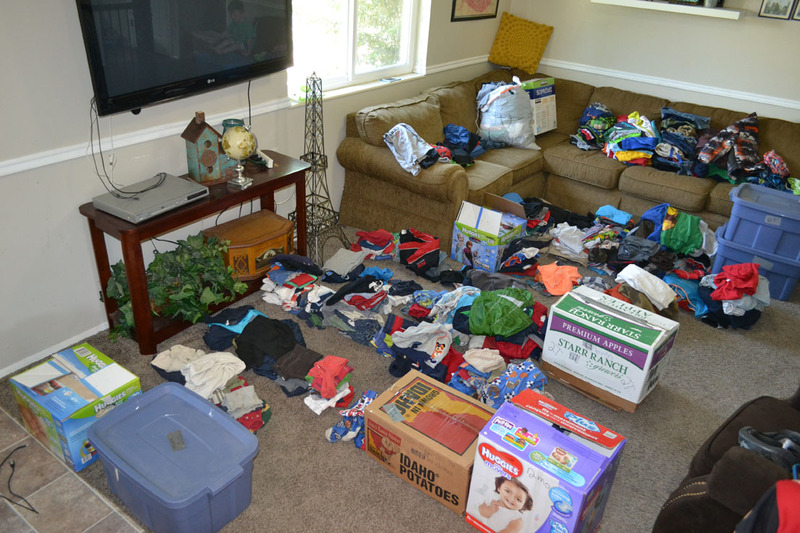 I’ll admit, at first I was totally overwhelmed seeing all of those clothes fill an entire room. How had I collected so much? Obviously, we didn’t need them all. Someone else could definitely be benefiting from them much more than us. Now it was time to get to work. 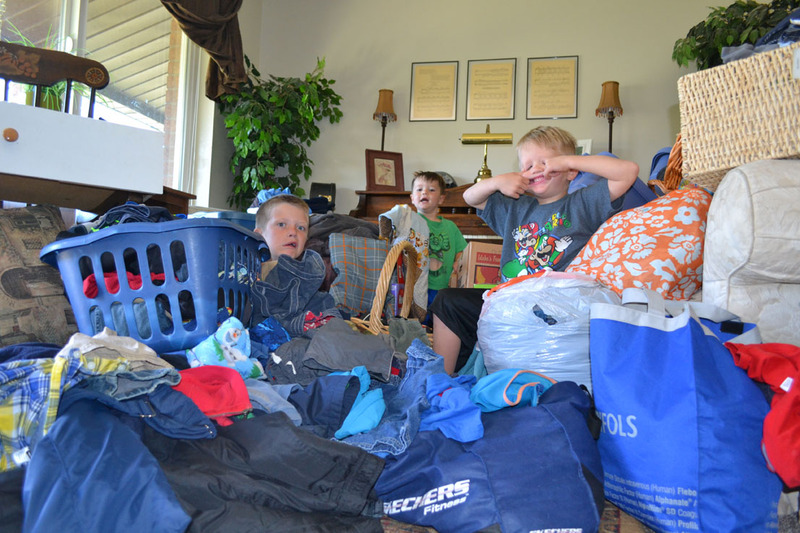 As my kids made forts in the piles of bags, I slowly went through each item of clothing–yes each item–and separated them into piles. Although it might seem like a daunting task, it didn’t really take that long. An hour–maybe two–if your kids aren’t playing hot lava and knocking over your individual piles. For most kids, they have that favorite shirt or that favorite pair of shorts that they wear all of the time. The rest of their clothes are slowly collecting dust in their drawers. So, the question is, how my outfits do they really need? As I asked a lot of mothers this question, a magic number kept coming up: Eight. All you need is eight outfits. It makes getting dressed a snap because there aren’t that many options to choose from. And last but not least, you’ll have LESS LAUNDRY! Here’s how many items of clothing I need for each age group. This took a little bit of time just because I wanted to make sure I chose the right items for each age group that I knew my kids would like. 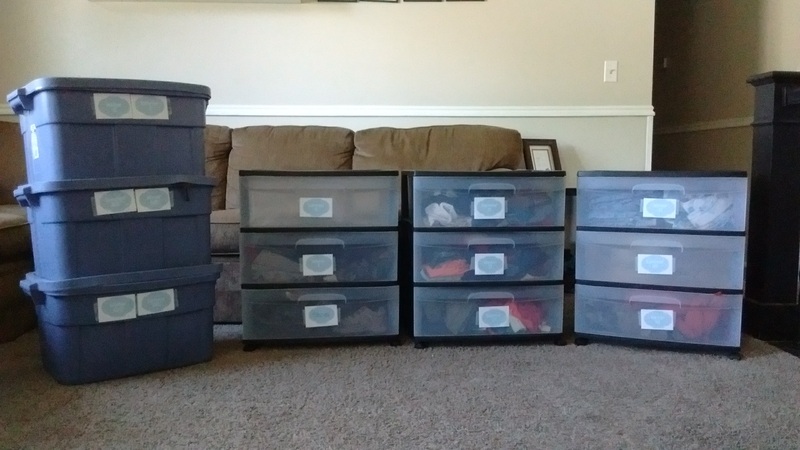 After fighting it for years (because I’m kind of cheap), I used old cardboard diaper boxes and kitchen garbage bags to store all of my clothes. This doesn’t work very well. They fall apart and are difficult to store in a neat and tidy manner. Then, when I was ready to switch out clothes for a different age, I would just get more frustrated. So, I swallowed my pride and bought these nice three-drawer storage bins. I like these because the drawers aren’t too large so I won’t be tempted to fit more clothes in than I really need. Then I simply put the clothes for each age group in the drawers. Don’t forget to separate each age group into summer and winter! You don’t need a pile of pants hanging around your house all summer long taking up space. Then I labeled each drawer (see free printable below) according to age group and stored all of them in the storage room in our basement. They are out of sight but easily accessible. And that’s it! Although this definitely took some time, I was able to do it all in one day. In the end, I said to myself, “Why didn’t I do this before?” I am so relieved that I don’t have all these clothes hanging around my house and now I can donate the rest of the clothes to someone else who needs them more. Win! Win! Check out the free printable below of the above photo for your convenience. 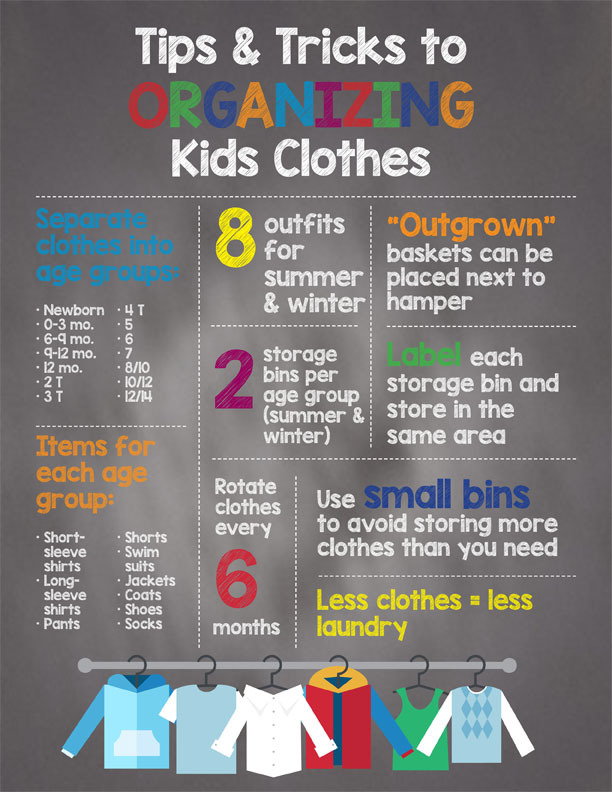 Have you recently organized your kids’ clothes? Let me know in the comments what did and didn’t work for you. Breastfeeding May Not be Your Thing……and That’s OK!